Operating Era: 1937-1954. Southern Pacific. Southern Pacific converted about 100 B-50-6 box cars to "temporary" cabooses beginning in 1937. The early conversions had different size windows on either side of the door. The original door was chocked open the width of a person-size door and that new door used for access. A door was placed in each end. Grab irons were added at the end door and leading to the roof at the side door. Later conversions differed in size and placement of windows, door braces, lettering and end door design. The cars lasted into the early 1950's. Some were converted to MOW and lasted longer. Decal Set Available. 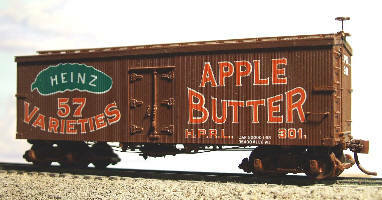 PLEASE SEE OUR DS BOX CAR SECTION FOR OTHER B-50-6/9 KITS IN THE #7300 SERIES.